When you're creating a chart, Quick Base lets you choose the colors. Whether you're displaying one kind of value or a bunch of different values (read more), you can customize the colors your chart displays. 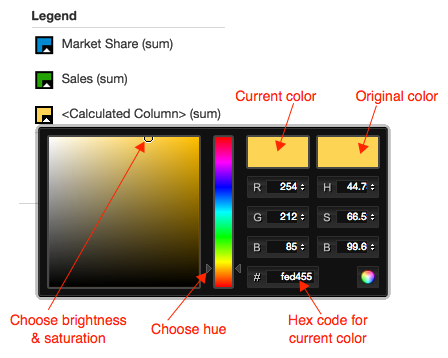 In the Report Builder's Legend area, click a color swatch to customize it. Quick Base displays a color chooser popup. The original color chosen for the swatch is reflected in the rightmost swatch on the color chooser. To get back to the original color, just click that swatch. Drag the circle in the graduated color box on the left to pick the saturation and brightness. Adjust the slider on the rainbow column in the center of the popup to change the hue. Click and drag up or down on the arrow controls shown on the right side of the popup. Double-click in a control to type in a specific value: 0-255 for R, G, and B; 0-360 for H; 0-100 for S, and B; or a standard hex color code for #. The color of the swatch in the Legend area changes as you perform these actions. Click outside of the color chooser to keep the color you've chosen. Quick Base returns you to the Report Builder.